At MAT Processing Technology we have focused on the development of equipment that meets the growing needs of the industrial laundry and textile rental industry. We are an industry leader in providing a comprehensive program for entrance mat processing and tracking from start to finish. MAT Processing Technology introduced the EZ Sorter Mat System to provide the latest technology in mat inventory control and route preparation to improve the efficiency of route loading. MAT Processing Technology is an industry recognized innovator of products and systems for processing, handling and finishing dust control and other industry related items. We develop and produce products aimed at improving productivity and increasing workplace safety by reducing the risk of back, neck and repetitive motion injuries. MAT Processing Technology Mat Rollers incorporate several operator safety features that virtually eliminate any possible pinch points where the operator interacts with the machine during operation. Openings in the machine work area are smaller than OSHA’s requirement of ¼ inch. Click here to view these safety features on MAT Processing Technology Mat Rollers. An optional photoelectric light curtain safeguard is available in addition to the existing manual emergency stop buttons. This safeguard device automatically stops the machine if the operator’s hands penetrate the light curtain in front of the mat rolling area. The photoelectric eyes for the light curtains are installed on both of the inside panels of the hood. 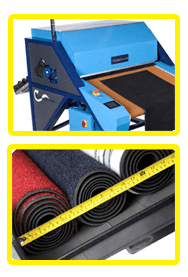 Our Laundry Products line includes Mat Handling Equipment, Mat Sorting Systems, and Transport and Storage Products.